Davis Weather Instruments is known for it's high quality products. According to our survey, Davis Weather Monitoring brand is the most highly reputed brand among the weather hobbyist and geeks. Davis Vantage Pro2 Wireless weather station is a very reliable station that provides accurate reading. The sensor suite has been designed using the latest technology and it offers a wide range of weather information. Here is a quick and detailed review of Vantage Pro2, which will help you determine whether or not you must buy it. 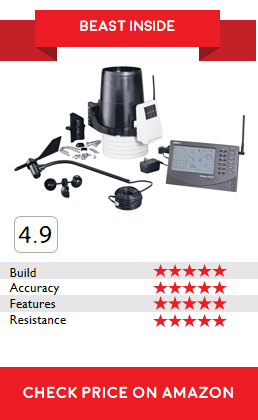 Vantage Pro2 is one of the more advanced weather stations by Davis and is suitable for a variety of purposes. It is more like a professional weather station and can be used by farmers, schools, gardeners, restaurants, and sports institutes. Some weather hobbyists or enthusiasts who like to watch and publish weather readings may also use this as a more involved home station. This station is known for providing accurate readings and thus is also suitable for the professions that have to rely heavily on weather information, such as fishing. In spite of being an advanced weather station, Vantage Pro2 offers easy installation because you don’t need to mount every sensors like in other weather station. Davis Brand did a fabulous job by integrating all the important sensors such as rain, wind, temperature and humidity into one single piece of hardware. It may take a little over an hour to install and set up the station even if you have the basic tools. All the necessary items required for installation are supplied in the box. Anemometer: Pro2 anemometer is very advanced and is capable of recording wind speeds of up to 170 mph. The readings are quite accurate even when there is thunderstorm or strong wind. It can also give you the average wind speed rating for a particular period of time. Thermometer: Pro2 thermometer is also very reliable. Even in the extreme cold or heat conditions, this weather station provides very accurate temperature readings. The housing of the station features a radiation shield which ensures that the temperature is not affected by heating on the inside. Rain Gauge: Pro2 features a professional-class rain gauge that provides some interesting readings. Not only does it provide the rain density readings, it also tells the rain rate. The magnets are customized according to the area where they are being shipped so that they continue to provide precise readings. Hygrometer: The hygrometer of this weather station provides relative humidity reading in the range of 0 to 100%. The radiation shield of the sensor array housing ensures accurate readings. Vantage Pro2 supports installation of the additional sensors besides the standard ones in the supply. If you need wider range of weather readings, you can buy sensors for solar radiation, soil temperature, soil moisture, and more. Well, the Pro2 isn’t simply a plug in to and play type of a weather station. It isn’t similar to a Vantage Vue. The Pro2 requires time for assembling it. We suggest keeping aside around half an hour and getting a place prepared to set up its sensors. Although the console of the desktop type does require slight effort for installation, it seems burdensome at times, however, isn’t strenuous. We shall describe this in detail, further on. We later will advise you with our recommendations for the placement of sensors. There is no competitor to the accuracy of Vantage Pro2 in the household weather station trade. The accuracy of the Pro2 is considered as its best feature among others and this has been indicated in the reviews from the experts and customers. Due to the introduction of a radiation shield which is aspirated by a fan in Pro2 Plus, the currently installed precise outdoor humidity/temperature sensor will do even better. You will get condition updates in 2.5 seconds. The Pro2 standard unit has got a radiation shield that protects from sunlight and hence results in more precise readings. The only thing it lacks is the fan aspiration. What is the need for this? In simple words, although the sunlight is not falling directly on the sensor, yet heat is developed inside the enclosed space. More accurate readings can be obtained in Pro2 using the fan aspiration. Any heat developed is pushed away from the area of the humidity and temperature sensors by Davis. The Pro2 rain gauge was lately redesigned by Davis to operate better in gusty events like tropical storms, hurricanes, and thunderstorms. Named the Aerocone, the shape of the gauge avoids turbulence at the inlet to the gauge and avoids the rain from entering the gauge. 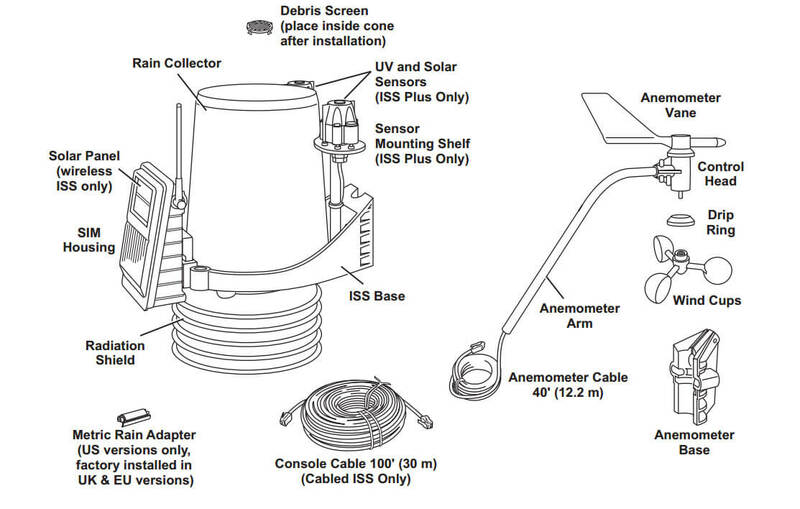 The anemometer makes use of the conventional vane and cup, which is the favored by the pros. It is independent of the humidity/temperature/sensors for the rain gauge, which enables excellent placement to achieve high accuracy. Care should be taken to place the humidity and temperature sensors at about 5 to 6 feet (eye level). The gauge and wind vane are to be placed at a height of about 33 feet. The greatest selling point of Vantage Pro2 over its low-cost sibling Vantage Vue is its upgradability. You can add more sensors to the Pro2 and what sensors are to be added depends on the individual’s needs. Gardeners will find the leaf wetness and soil moisture sensors useful, while out of house enthusiasts will prefer the solar radiation and UV sensors. You can go for all four or just one: this is possible because of the Pro2’s expandability options. Pro2 Plus Vs Pro 2 – Which is the better option? Well, we have noted that Davis sells away 4separate Pro2 models; these are the Pro2 version of the wireless and wired, as well as the Pro2 Plus wireless and wired versions. Our primary recommendation of the Pro 2 model is its version that is wireless since it has a sensor which is greatly flexible along with a perfect placement of its console. As discussed previously, the primary difference between versions of Pro2 Plus and Pro2 is the radiation shield (fan-aspirated) included within the model of Pro2 Plus. Also, the Plus model possesses the standard solar and UV radiation sensor. There are no other differences between both the models, rest of the features are identical. We suggest an enhancement of the Plus model in case there is a requirement for accurate measurements particularly forthe outdoor monitoring ofhumidity and temperature. Nevertheless, if the accuracy of measurements is not a criterion for you, then the model of Vantage Pro2 is sufficient. The Pro2 has similar connectivity issues as the other stations of Davis. The cost is considerably high and the interface is quite outdated. However, if you need to transfer data onto your PC or other services such as the Weather Underground, then your only option is to make use of the apps available with the Android and iOS devices. Three versions are available to choose from: Mac OS and Windows platforms have one each and a version called WeatherLinkIP, which is an internet-only version which connects to the router directly. We would recommend this version since both the Mac and Windows versions, need you to keep your PC continuously on so that data can be uploaded to the web. The software is also included along with the WeatherLinkIP. If you require to download any data to your PC, it can be done, however, it requires a slightly complicated system to make the respective software work. Although, for this you require to be aware of the IP address of the dongle of WeatherLinkIP. In case you do not require this, then you can simply obtain all your data using the WeatherLinkIP online. For this, you require to have the ID of the device as well as the key which is stated over the dongle. Begin by cutting power to the console (desktop console). 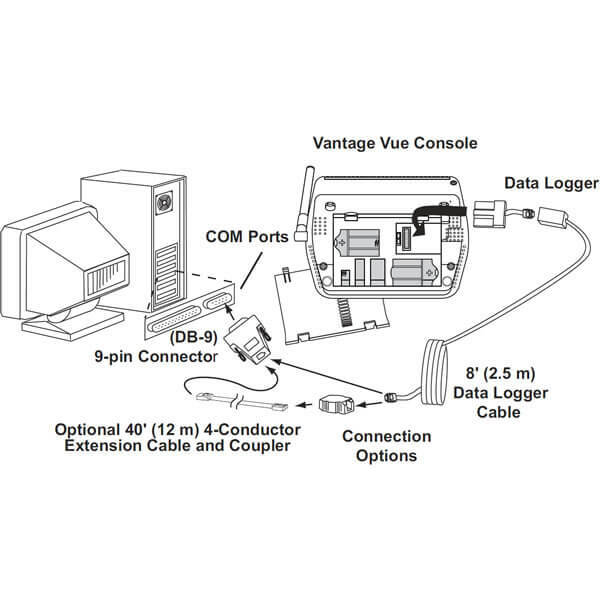 After it is cut off from power, you can plug in your dongle as well as your cable to the router for Ethernet. Once you power the console again, you will get the sound of beeps of confirmation. Once this process is complete, the remaining part is registering with an online account on the website Weatherlink.com. Upon setting up, this information will be accessible online. In order to obtain your respective station on the software the Weather Underground, you need to click the link ‘My Account’, then click on ‘Uploads’. Here there will be space to enter your required information. Once you have completed, click on the link‘My Weather’ in order to view your real-time data represented graphically. Further, you can go around clicking on other options to view some other details as well. One caution: Currently, Davis doesn’t offer any graphs and similar representations, so if these are your requirements then you better choose pages of the Weather Underground. As your data gets online, it can be instantly viewed by you via the WeatherLink app which is the official app of Davis. However, in case you have got your station set up recently, you require to wait for a while so that it appears inyour app sincewe were not able to view our station using the search function of the app for at least around 1 or 2 hours. The sensory array of the wireless version of Vantage Pro2 is powered by the solar energy and it uses a low-power broadcasting technology to transmit the data to the console. The sensor unit is capable of transmitting the data to any number of consoles within the range. Hence, you can connect multiple display consoles at various spots inside the house. If you need to transmit the data over a larger distance, you can use the repeaters, which can extend the reception range to up to 2.5 km. The console of Vantage Pro2 acts as a repeater and hence can retransmit the data to another console, thereby increasing the transmission range. The console also provides weather forecast based on the current and historical data. Display Console will be providing you many weather data which could be useful for both weather geeks and normal people. You can get local weather forecast, Outdoor and Indoor temperature and humidity, barometric trend arrow, rainfall data and much more. Share Real Time Weather Data via Internet using Weatherlink.com. However, you have to purchase WeatherLinkIP from Davis.net to get this features. The solar energy console also features a backup battery for power supply at night. The console has over 70 alarms for various weather conditions. This weather station is also compatible with the data logger for which the software package is available for purchase additionally. Davis Brand has packed alot of features which could benefit and saves you time. We’ve listed the main & unique advantages of this model which most of the weather monitoring stations doesn’t have. We researched hours but we came to a conclusion that there is not much Cons in Davis Vantage Pro2 model. As you already know, It is an high-end model which is quite expensive, so you get the most out of it. Vantage Pro2 is a more state-of-art weather station with a bigger price tag. Hence, it is not for those who are looking for low-cost stations. To be honest i couldn’t find any negatives in most of the Davis Weather Station. Vantage Pro 2 Wireless is one of the high-end model which could be expensive but it will be the best investment you would have ever made. In fact, It maybe the best in class. Considering it has a quality hardware, sensors and features, obviously every weather geek and professionals will love it. 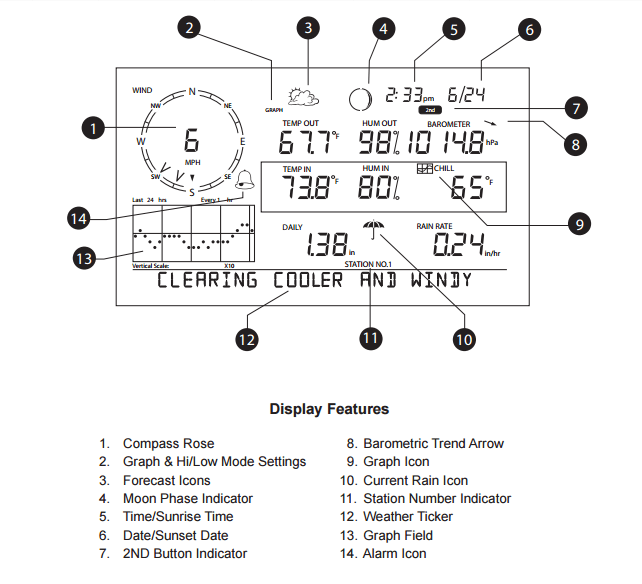 This model also enables you to customize the weather station according to your needs. You can add additional sensors and accessories. It’s upto you.